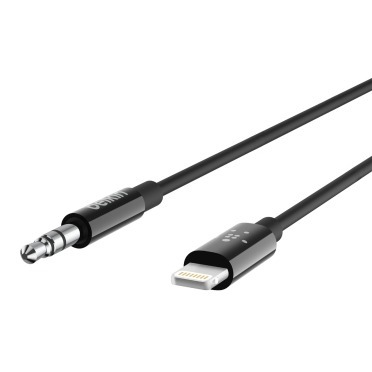 Accessory maker Belkin on Tuesday launched a straightforward 3.5mm-to-Lightning audio cable, offering a way for owners of recent iPhones to connect to 3.5-millimeter headphones and speakers. The MFi-certified cable converts digital signals to analog, and is available in 3- and 6-foot versions. It's intended for the iPhone 7, 8, and X, which would otherwise require adapter dongles. Apple began stripping out headphone jacks with the iPhone 7, preferring Lightning and Bluetooth instead. Online orders are now open. The 3-foot cable is $29.99, and the 6-foot version is $34.99. It's uncertain whether or not Apple will include a Lightning-to-3.5mm adapter with this year's iPhones. Removal has so far been speculative, but might also make sense, since it costs the company extra and iPhone buyers will have had two years to go wireless or get needed adapters and cables. At the same time, 3.5-millimeter jacks remain an audio industry standard, even still on many Apple products with lesser space and waterproofing constraints like Macs, iPads, and Beats headphones.